Today in the town of David a Savior has been born to you; he is the Messiah, the Lord. The story of Christmas is familiar. Many of us can recite verses and sing choruses that recap the holy day without so much as a second thought. It is said that familiarity breeds contempt – so I wonder. I wonder and I search my heart. When I sit and search long enough to listen to God’s still small voice, I grapple with the familiar and I groan for the fresh… and I wonder. Have I shopped, cleaned, and baked away the season without bending a knee to worship the Savior? Have I decorated my home, but failed to focus my heart? 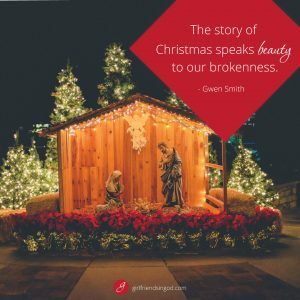 The story of Christmas is the ultimate story of life, of hope, of freedom. The beautiful and mysterious intersection of humanity’s depravity and Divinity’s provision. A complex invasion of darkness by light. By love. By a love that breathes life and brings beauty. In the beginning, Love breathed life into the made-from-dust lungs of Adam. Life-giving love. The perfect and complete love of a holy, triune, eternal God who spoke words and created new galaxies – new wonders – new worshipers. All was made so that He might be glorified. We His image bearers, however, are different from all other creation in that we are made to know Him. Personally. To know Love. True, pure, eminent love. Then, stains of rebellion brought separation. Rebellion of God’s plan – of His spoken word, of His will. Human wants and desires rose to rule – our own wills were done instead of God’s: in the Garden… in my life… in yours. And though rebellion demands death, (Romans 6:23) God’s love pursues with life-giving power. This Love that descended from heaven to earth, came to speak life to death through the incarnate Grace that was wrapped in swaddling clothes in a humble manger. From the cradle to the cross, Jesus came on a love mission. Jesus came upon the no-vacancy scene in Bethlehem to annihilate death – so that we, who are hopeless without Him, could experience love, forgiveness and freedom. Full life. Abundant life. Beauty-from-ashes life. 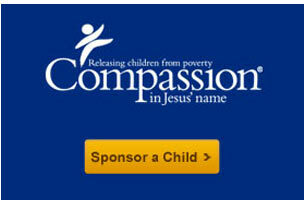 because he has anointed me to proclaim good news to the poor. 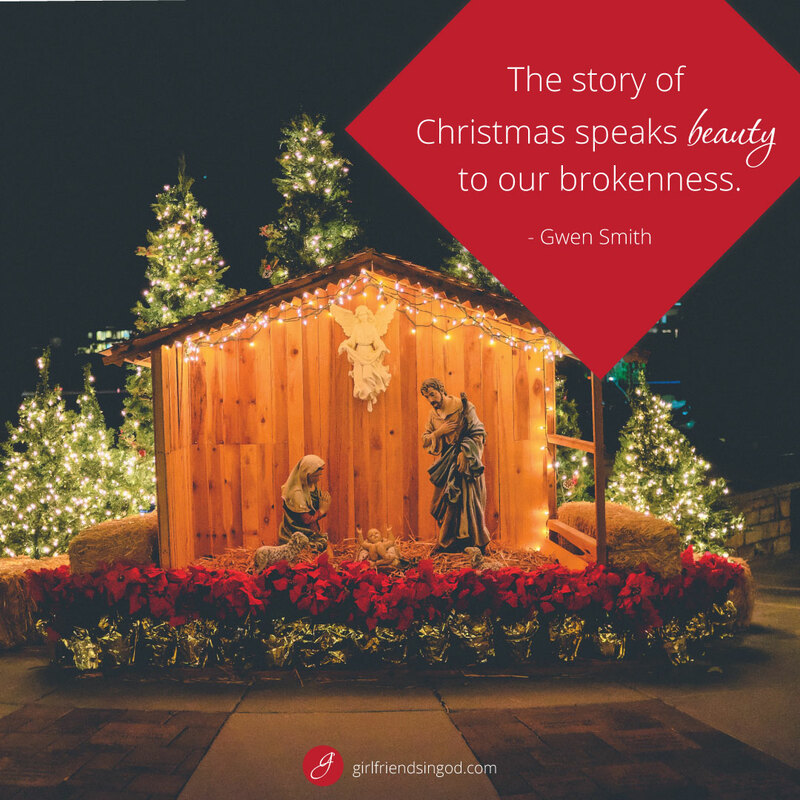 The story of Christmas is the story of Jesus. The story of captives being set free, of the blind gaining sight, and of our stains of rebellion being washed white in his blood. The story of Christmas is the story of life. Today, as we move and meander in the mundane, I pray that you would join me in being gripped by a fresh and compelling awe for this perfect Love that breathes life and speaks beauty to our brokenness. Holy LORD, incarnate Grace, You are beyond amazing! My heart is overwhelmed with gratitude for Your love. Help me to live in responsive awareness of Your grace. Let’s pause for a shared moment of worship. Click here to visit my blog or my Facebook page and allow the songs that I’ve posted today lead you in further adoration and praise! Our fast-paced lives make it hard for women to grow in faith. 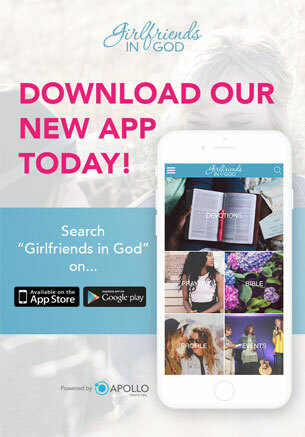 Gwen Smith is a speaker, worship leader, and author who helps women know and trust God more. Here latest book, I Want I ALL, includes a Bible Study Guide right in the back of the book! There are endless opportunities for us to worry, wander, and wonder. But that’s not God’s best for us. Though we remain broken and impacted by an imperfect world, you and I can get through anything in the power and hope of Jesus. CLICK HERE to get a FREE Ebook: 7 Day I WANT IT ALL Devotional and Bible Study, and join Gwen Smith as she shares Biblical truth, honest struggles, and practical help. Good Morning! Thank you for sharing this message! AMEN! I want to live the truth of God’s amazing love! God’s blessings always! Merry Christmas!! !